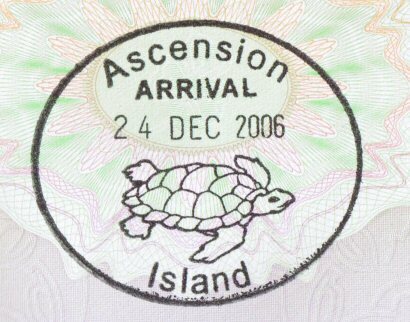 Welcome to the account of our visit to Ascension in 2006/7. On our previous visits to Ascension we had flown out by ourselves, but this time round Johnny was with us in the UK to meet up with Cecile, a lady from his past when he lived in the in the Seychelles, and with Cecile were her three boys, Trevor, Collin and Yanick. This somewhat complicated the logistics as we were suddenly 4 adults and three boys with corresponding 15 pieces of luggage. So we set off for Brize Norton on the 20the December with a little bit of trepidation as a) it was very, very foggy and b) Johnny had acquired this reputation for always being on flights that had long delays for a whole variety of reasons. The check-in at Brize went smoothly despite the huge pile of luggage and we settled down in the departure lounge for a take off some time around 23.00. However after a while it was announced that the fog was too bad, and the flight was delayed till the following morning. Normally people are put up at the Gateway House hotel (aka. hostel) at Brize, but all the rooms were closed due to refurbishment so we all spent the night on the lounge floor. The following morning we were bussed back to the terminal, and couldn't take off straight away as there had been a mix up at Heathrow where the luggage had been x-rayed and packed in the wrong size pallets. Eventually we boarded the XL airways charter 747 jumbo around lunchtime and made it to the end of the runaway. Once there the plane started to turn and then ominously stopped at a strange angle. After a while the captain came on to say that a cable had broken in the nose wheel steering so our journey by air to Ascension was suddenly reduced to a tow by a tractor back to the terminal. After much hanging around everyone was dispatched to The Oxford Belfry to spend the night with the tab picked up by XL airways. This was a bit ironic as The Oxford Belfry meant driving back almost all the way back to Aylesbury as the Belfry is on the east side of Oxford. The following morning it was back to Brize Norton to await a gap in the fog which continued to linger. We were mysteriously told that the Jumbo had departed for repairs (We were later to discover that the repairs were to fix a hole caused by a vehicle backing into it by mistake). So yet again everyone was to be in a hotel over night and this time there was not one hotel to take everyone so the filght's passengers were spread over several hotels in Oxford and ours was to be the Oxford Spires. The plan the following morning was that the RAF were going to try and find a "spare" TriStar for us and we would either be coached back to Brize Norton or up to Manchester depending on the fog. Oh and an extra factor in the equation was that the TriStar might need to be "reconfigured" to have enough passenger seats so yet another potential delay issue. Morning came and, as it was to be Manchester, one coach turned up at the Spires, and rapidly filled up, so we decided to wait for the second coach. We waited and waited ... and waited. Eventually someone rang up RAF operations at Brize to discover that the second coach for the Spires had broken down but another was on it's way. So time was passing, and by now it the 23rd of December and the Saturday prior to Xmas which meant that the motorway traffic was not going to be light. The coach then turned up but had to make a detour via the Best western hotel to pick a few more people up but then there was a luggage space issue. Now the army lads who go to the Falklands via Ascension are not small people and have quite big kitbags as main luggage and then maybe more items as well. Something predictable, one would think, but not today. So we left some of them behind, but heard soon after that a mini-bus had picked them up ok.
Of course in spite of taking the toll M6 we hit the inevitable motorway traffic jam once we got near Manchester and thought at one stage that the flight was going to go without us. 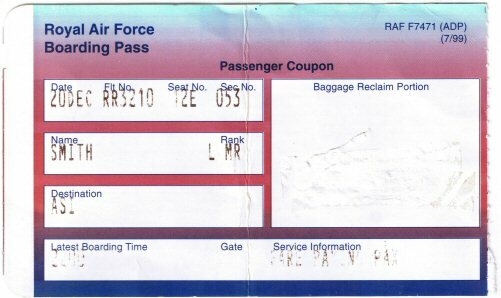 Then when we got to Manchester it was announced that being a civil airport there was a weight limit on individual items of luggage ( presumable some Health and Safety ruling), so the check in process was delayed while some of the army lads had to redistribute things. 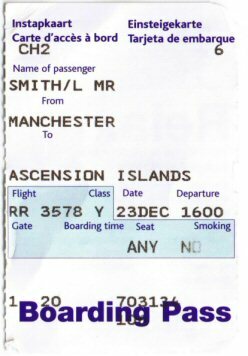 Hopefully the pilot will know where we are going as the powers that be at Manchester Airport seem to think it is Ascension Islands and not Ascension Island. Eventually we patiently joined the enormous queue through airport security where all manner of things and liquids were confiscated. Though for the life of me I could not think of one reason why anyone would want to hijack an Ascension flight when they always contain quite a few army people going to the Falklands and there is always the potential to have SAS or SBS guys as well. I suppose all's well that ends well and we eventually took off at around 16.00 for a simple straight forward flight after the hustle, bustle and confusion of the preceding 3 days arriving at Ascension in the early hours of 24 December. As Johnny had a full house, we were staying in one of the suites at the Obsidian Hotel so on arrival there we just collapsed in a heap and crashed off to sleep very quickly.